the resident evil series has a lot in common with the police academy series. having seen every single entry available, i would not be able to tell you anything specific about each one. all i remember from the first two are a montage of zombie killing action scenes. oh and the first one(directed by her husband paul w.s. “the non talented one” anderson) opens with milla jovovich getting naked for no reason. 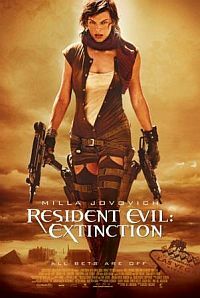 resident evil: extinction differentiates itself by taking place mostly in the desert. kinda like that one police academy movie where they go to miami. this one opens with milla waking up in the same lab as the first one, unnaked. as she tries to escape the lab, that laser trap from the first movie, a ripoff from cube, makes another appearance. i love it when filmmakers know that their movies are easily forgettable. remember how cool it was when we did that in the first movie? here it is again. it also shows up at the end of the movie, i guess they worry that audience members won’t remember what they have seen 85 minutes ago. either that or they really think it is a very cool trap. there’s also another inconsequential opening action sequence that’s right out of the hills have eyes. then i fell asleep when the movie shift its attention to a group of convoy trying to save people from zombies, i woke up just in time for a ripoff of the birds and milla joins the group. there are a lot of zombie movies staples in this. they need to get somewhere supposedly not affected by zombies(alaska in this case). after taking a democratic ballot and right after they leave, they need to stop for supplies. there’s a mad scientist experimenting with superpower zombies. scientist himself turning into monster. someone will get bitten and not tell anyone. someone will sacrifice his/herself so the others can escape. someone will have to shoot their friend in a split second before said friend turn into zombies. i think i just fell asleep reading the rest of the wikipedia entry on the movie. on second thought, this is nothing like the police academy series, since i can see myself watching any one of the police academy movies again. maybe when they reboot police academy, they can do it in 3d so they can claim it as the highest grossing entry in the series. p.s. for a real eye opener, check out the starz documentary hollywood goes gaming, where video game movie auteurs uwe boll was interviewed and paul “the inferior one” anderson is considered to be the top 3 in the genre. which tells you all you need to know about the state of video game movies.